Just Published! This book focuses on the most frequent and most important notarial responsibility, to notarize traditional documents. It was written to inspire and foster today's notary to always perform thorough and sound document notarizations. State laws are sometimes vague or non-existent, so more than 230 best practice standards are included in this book that,  tell notaries what to do,  tell notaries how to do it, and  tell notaries why to do it. Michael Closen has been called "the dean of notary experts." He is widely regarded as one of the leading authorities on notary ethics, law and practice in the United States. He has more than 40 year of experience in the legal profession, and has served over 25 years as a commissioned notary public and specialist on notarial issues. 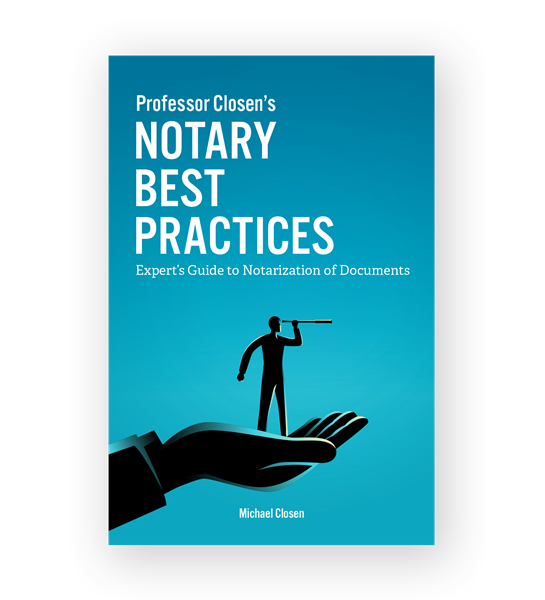 Professor Closen's Notary Best Practices Expert's Guide to Notarization of Documents focuses on the most frequent and most important notarial responsibility, to notarize traditional documents. It was written to inspire and foster today's notary to always perform thorough and sound document notarizations. State laws are sometimes vague or non-existent and is why more than 230 best practice standards are included. Those notary best practice standards have been drawn from notary statutes and regulations, from common law court opionions, from model laws proposed by private organizations, from publications of experts in the notary field, and from his own experience as an attorney and law professor, notary public, and notary educator and consultant. These best practices standards included in this book,  tell notaries what to do,  tell notaries how to do it, and  tell notaries why to do it. When people understand what, how, and why to do a thing, it's easier to remember and act accordingly because they understand, rather than because they have tried to memorize a procedure, or because they have simply been ordered to take action.